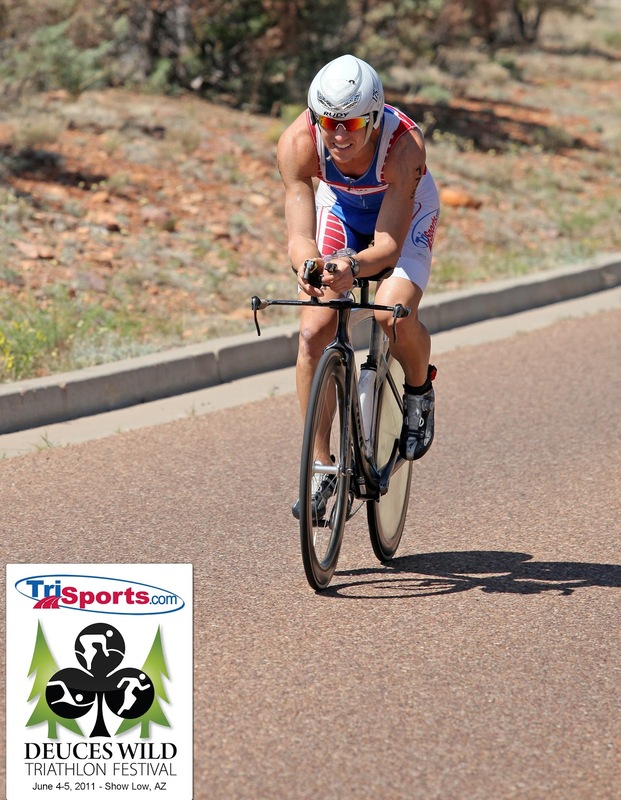 My premier sponsor - Trisports - puts on a terrific triathlon event every year called the Dueces Wild Festival. This festival is part of Trisports' philantrophy arm and all proceeds go to charity. In addition, sponsors kick in a ton of product for a raffle and this year they had over $40,000 in prizes!!! As for racing, Dueceman takes place in beautiful Show Low, AZ and at 6,500 feet. Racers pick from either a Half-Ironman or Olympic distance triathlon on Saturday, and they can opt for an Xterra on Sunday. All three races offer generous prizes to the top finishers. For families, there are two different kids races depending on the age of the children. 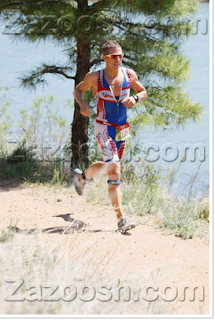 Here is recap of my Half-Ironman race. Swim (29:57): Being at altitude I had no idea how my body was going to respond in the swim. I know that normally I use a lot of oxygen to get through the swim and I already breath every stroke. Since I can't breath anymore, I knew I would have to take it out extra conservatively. I swam alone to the first buoy but as I reached it I grabbed on to some feet and got a tow to the second and final buoy. At the second buoy I could tell my tow was getting tired so I left him and forged ahead on my own. I reached shore, stood up, and all I could say was wow. I was completely gassed as headed toward transition. Bike (2:23:14): After fumbling through transition and fumbling getting on the bike, I focused on putting down the power and catching the leaders. I was told I was over two minutes down and there were three people in front of me. I pushed hard and caught two of the three within the first five miles. I was absolutely flying and I don't think ever saw a speed much less than 28 mph. Then I came to a long, flat stretch and I got my glimpse of the leader and I was enticed to pedal even harder. For fifteen miles I widdled down the time gap, but it was coming down so slowly. At mile 22 I made the decision to go anaerobic and finally closed the gap by mile 25. At mile 28, I came to the half-way point and I had covered it in under an hour. I thought I was on course to smash the bike course record and kill the race but I was in for a rude awakening. For some reason even though I was flying I didn't realize that I had a magical tailwind on a slight downhill. As I made the turn at mile 36 to head back to Show Low, I was hit with a brutal headwind and a long-climb. It was slow going on the way back to Show Low and my course record hopes were quickly being decimated. By mile 50 I was done and ready to get off the bike. I rolled back into transition as I mentally prepared myself to run my first half-marathon at altitude. Towards the end of the first lap I made a wrong turn and had to back track losing some time. It wasn't a big deal and the competition wasn't even in sight. I continued on lap 2, keeping the form strong and focusing on the finish. My form got a little sloppy towards the end but that was mostly because I brought the wrong shoes for the course and my feet were badly blistered. Nonetheless I soldiered on and finished up in 1st place. Overall (4:29:55): It was a great race for me and great opportunity to represent Trisports with the rest of my teammates. 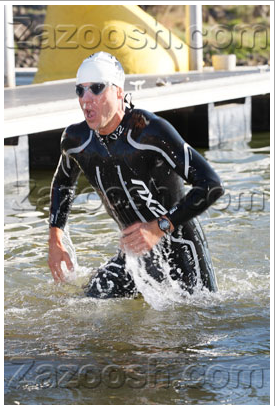 As for my own performance, well I thought I had a good swim, a rockin' bike, and solid run. I am definitely putting this one back on the calendar for 2012 and I highly recommended it to anyone from Arizona and New Mexico that wants to escape the heat. Trisports Racing did fantastic job of putting it on and I was super impressed!! If you are thinking about doing this race in 2012 then here is a little video that Trisports put together of the race. 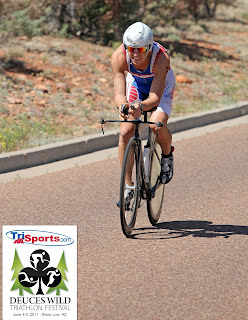 Thanks: As always, I want to thank Trisports.com - use my Trisports coupon code to save 20% on your next order. Each code is unique for you so please contact me thru the above "Contact" tab and I will email you back the 20% off code. Codes can be used at anytime - no waiting for a special sale. They expire 12/31/14. Please remember to fill in your email address so I can reply back to you. If you don't provide an email there is no way for me to contact you. You can also tweet at me or message me on Facebook if you prefer.